During the creation of the template you decide that you still want to turn functionalities on or off. The template has been published and you discover that you still want to turn certain functionalities on or off. Which role do you need? First create a template or click the Templates tab and click Edit at an existing template. Then go to the Settings tab. Each template type has different settings. Some options below can only be seen with the course type Social or Game Based Learning. Learners can share information, ask questions and discuss in the course overview. In addition, they can also communicate with each other in the activities, provided you indicate this in the activity settings. Allow learners to discuss with each other within the activities. You can then turn this off per activity. Give learners the opportunity to send each other private messages. Uncheck this option if you do not want to use the MemoTrainer. The progress bars that have to do with the MemoTrainer (such as knowledge intake) will then no longer be visible. 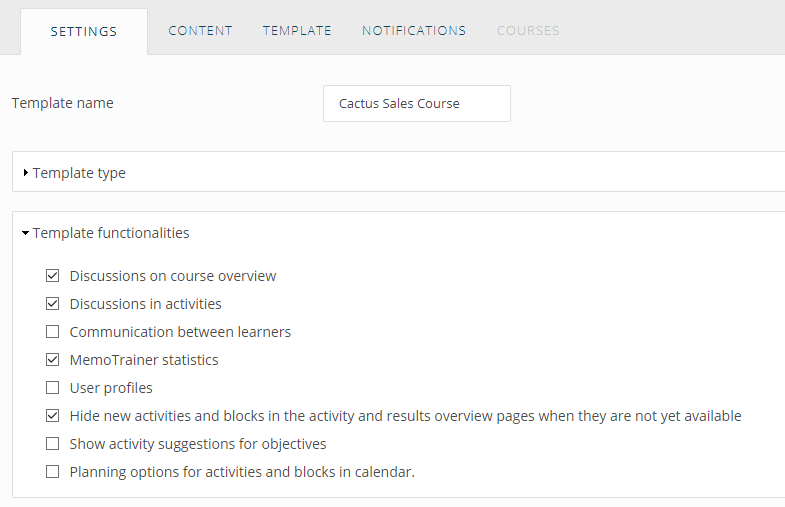 Learners will see an instructor and learner list on the right of their course overview. With user profiles they can click on a user to see the biography that learners can add via their account settings. With this setting, activities and blocks that are still locked by conditions are hidden in the learning journey of the learners. Uncheck this option if you want to give the learners a preview of what the whole journey consists of. There is a lock for these activities. If you use an adaptive learning journey, learners can see suggestions for activities that are used to achieve an objective per learning objective in their objectives overview. They can then start that activity directly from this overview. You only see this option if ReadSpeaker is enabled in your environment. When this is turned on, the text of the questions and content parts is read to the learners. This way learners with a visual impairment can follow the course well. Once the template has been published, you can no longer adjust the 'screenreading service'. Which template type should I choose? Tutorial: How do I create an adaptive learning path for the learner?